But if it is preached that Christ has been raised from the dead, how can some of you say that there is no resurrection of the dead? ….if Christ has not been raised, your faith is futile; you are still in your sins. Then those also who have fallen asleep in Christ are lost. If only for this life we have hope in Christ we are to be pitied more than all men (1 Cor. 15:12-19). My husband and I have already attended a few funerals this last year. They were peaceful funerals – funerals of saints who lived in the hope of Christ and saints who are now rejoicing in heaven with our Lord. There were tears at these funerals, to be sure, but they were tears that were spilled into the cup of the new covenant established by Jesus’ blood. The truth is that we live on a slope. That truth is that all life tilts towards the grave. Human beings – from the very first moment of conception, slide towards death. Most people are afraid of burial. There are many who quip: “I’m not planning to die” and then they laugh. 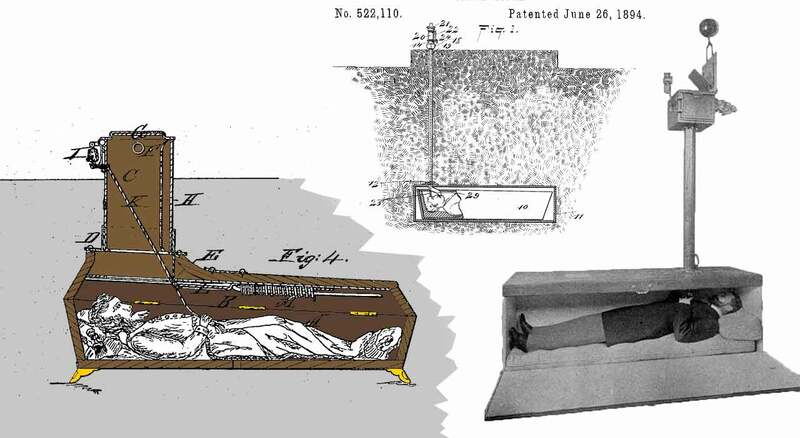 To be put into a coffin, into a small confined space, and to have a lid closed over your face – that is not a pleasant thought. For people who have not spent much time contemplating a Savior, it is an experience they would rather avoid. WHERE THE SCARY STORIES BEGAN? Perhaps Alice was, for some unknown reason, deeply unhappy and tried to drown whatever it was that discomfited her. She did have two children and was not in any material want. Besides brandy she also regularly imbibed poppy-tea. Poppy-tea is an herbal infusion brewed from poppy seeds. The dried pods contain opiate alkaloids, primarily consisting of morphine. The tea is consumed for its narcotic effect, and in small amounts was used as a sedative. Alone one evening, her husband having traveled to London on business, Alice, drank a sizable quantity of this tea. Afterwards she fell into a deep sleep – a sleep from which she could not be wakened. The household servants called the local Basingstoke apothecary. 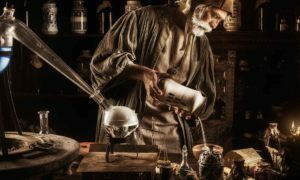 After checking her, the apothecary concluded that Alice had died. Alice was, as stated previously, a very heavy woman. Although husband William had sent instructions that the funeral be deferred until he returned from London, other relatives deemed it necessary that the body be interred as quickly as possible. Old manuscripts spell out that “the season of the year being hot, and the corpse fat, it would be impossible to keep her.” They did not heed William’s request to wait and Alice was buried without any delay. A few days later some boys, playing a game near the cemetery, heard a voice calling out. It is not recorded what the voice said. In panic they ran home and told their parents. Initially no one believed these boys, but then the same voice was heard by others passing the graveyard. Following the sound of the voice, they arrived at poor Alice’s grave. Upon opening the coffin, they discovered her body to be most “lamentably beaten.” It was concluded that Alice appeared to have regained consciousness in the coffin and had tried very hard to escape. No one could detect any signs of life in the woman at this point and so the lid was put back on and the coffin lowered into the earth once more. A coroner was sent for to examine the body the next day. Great was everyone’s consternation, however, when upon opening the coffin for the second time, the body was found to have “torn off a great part of the winding sheet, scratched herself in several places and beaten her mouth until the blood ran.” The coroner, upon examining the body very carefully, did pronounce Alice Blunden finally dead. She was reinterred once more. Those responsible for her initial burial were summoned to court, but although they were fined for neglect of duties, no one was ever convicted. A fairly gruesome tale, to be sure. 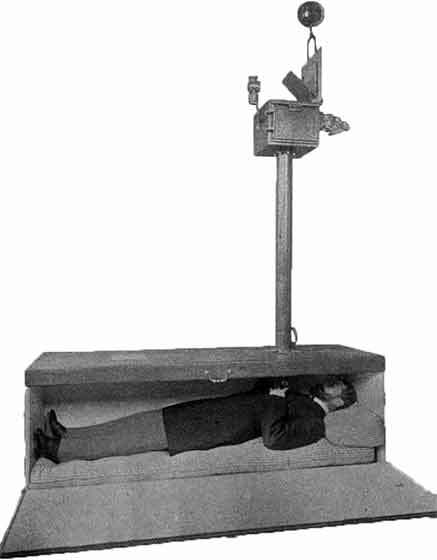 A “safety coffin” featured in the January 1, 1901 Medical Art and Indianapolis Medical Journal: Volume 4. The fellow inside demonstrates how he can ring a bell, raise a small ball high up in the air to alert passersby, and also open a passageway for air. There is another story of a man by the name of Robert Robinson who lived in the mid 1700s. In his youth Robert attended the dissenting seminary at Plasterer’s Hall – an academy which trained young Christian men for the ministry and a school which had teachers who were devoted to Calvinism. Robert abandoned Calvinism, however, while at the academy, and began leaning heavily towards Unitarianism. After graduating, he served several parishes, but resigned amidst controversy in 1777. Uncomfortable with the thought of dying and worried about being buried alive, Robert Robinson made preparations for his interment. When he died one day in December of 1791, his coffin was placed in a square, red-brick building which had been built on his property. At his instructions a movable glass pane was inserted into the coffin, and his little mausoleum also had an inspection door. A watchman was instructed to pass along daily after Robert’s death to see if there were signs of breath on the glass pane. His relatives, as well, were requested to visit his grave periodically and to check for signs of life. 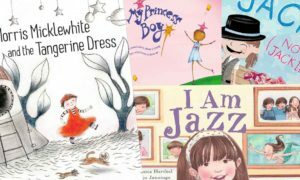 These are interesting stories, telling stories and stories which reveal a great deal about human nature. The truth is that if people rely on their own reasoning and philosophy, they have no hope at all. Most people are afraid to die, let alone be buried in a coffin. Most people are afraid of what happens after they die. God has, however, in His great mercy, given us a note, and has left us instructions with regard to our fears of death and burial. He has penned, through the Holy Spirit, the factual story and the reality of an empty tomb in all four of the Gospels – an empty tomb, a resurrection and an ascension. The answer to the fear of death and burial is to become well-acquainted with this reality of the empty tomb; to become well-acquainted with the Savior, Jesus Christ, the eternal Son of God. He teaches that although our earthly sojourn will end one day, and that physical death will end our earthly life, it is but our doorway into eternal fellowship with Him. The tomb did not hold Jesus. “Christ has indeed been raised from the dead, the first fruits of those who have fallen asleep” (I Cor. 15:20), and it will not hold anyone who believes in Him. “The body that is sown is perishable, it is raised imperishable” (I Cor. 15:42b). …thanks be to God! He gives us the victory through our Lord Jesus Christ (I Cor. 15:57). Christine Farenhorst is the author of many books, her latest being Katherina, Katherina, a novel taking place in the time of Martin Luther. You can read a review here, and buy it at www.sola-scriptura.ca/store/shop.